Bylakuppe, Karnataka, India, December 20, 2017 – Sera-Jey Monastery is next door to Sera Lachi where His Holiness the Dalai Lama is staying. This morning the longer walk was from the Monastery building through the beginnings of a crowd that eventually grew to more than 15,000. As is his custom, His Holiness stopped on the way to greet old friends and comfort the aged and infirm. Before stepping up onto the daïs at the head of the debate yard, he unveiled a plaque to inaugurate a Special Study Centre, a co-operative project between Sera-Jey Monastery and the Indira Gandhi National Open University (IGNOU). His Holiness had come early to perform the preparatory rituals and procedures for the Hayagriva Empowerment he was going to give. “Hayagriva is one of a set of deities known as the Eight Pronouncements belonging to the class of Highest Yoga Tantra,” His Holiness explained. “And although there is a tradition in some cases of giving tantric empowerments to groups of no more than 25 people, since the disciples’ main qualification here is faith, I thought it would be good to give the empowerment in public. Hayagriva is a very wrathful aspect of Avalokiteshvara. Tibetans have had a long relationship with Avalokiteshvara and as a result of past prayers and karma I seem to have been involved with fulfilling his wishes. Virtually all the temples built by Songtsen Gampo in the 7th century related to Avalokiteshvara, clearly he has a special connection to Tibet. His Holiness alluded to the way the third turning of the wheel of dharma presented the subjective mind of clear light, while the second turning of the wheel of dharma referred to clear light in terms of objects. He mentioned that the inner tantras, the maha, anu and ati yogas, emphasize the clear light nature of the mind. Since ati yoga employs the clear light mind of pristine awareness in the path, it’s necessary to make this mind manifest within, which entails not a little effort. In addition, His Holiness touched upon the Nyingma classification of the distant ‘kama’ teachings that include what Buddha Shakyamuni taught, the near lineages of the ‘terma’, revealed treasure, teachings and profound visionary teachings. His Holiness revealed that the Hayagriva empowerment he was about to impart comes from the collection of secret visions of the Fifth Dalai Lama containing 25 sections and known as ‘Bearing the Seal of Secrecy’. 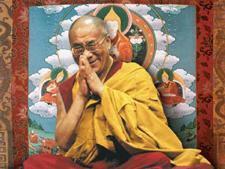 “I received the empowerments for this collection from Tagdrag Rinpoche when I was boy,” His Holiness disclosed. “He’d received them from Phurba Chok, who had been tutor to the 13th Dalai Lama. Although I received the entire cycle from Tagdrag Rinpoche, I had some doubt about whether a Great Perfection (Dzogchen) instruction related to an Amitayus practice called ‘Extracting the Essence’ had been included, so I received it again from Dilgo Khyentse Rinpoche. And having done so, I undertook the retreat. The Abbot of Sera-Jey Monastery who had requested the empowerment offered a mandala and representations of the body, speech and mind of enlightenment. 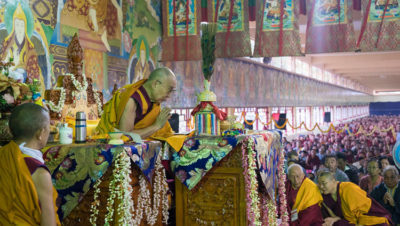 Before proceeding with the empowerment His Holiness recalled the beginnings of the Tibetan settlements in Karnataka, of which Bylakuppe was one of the first. Mysore State, as it was known then, was led by Nijalingappa, a dedicated supporter of Tibet, who he had met first in 1956. He remembered being here when Tibetans were first felling trees and clearing scrub from the land. There was nothing else here so they stayed in shelters of bamboo. Gradually the settlements began to grow and as they did the decision was taken to move monks into them from the camp at Buxa. Thus, Drepung, Ganden and Sera were re-established. Meanwhile, with great dedication, Penor Rinpoche set up Namdroling Monastery nearby. His Holiness commended the way study programs have been restored in some monasteries and launched afresh in others, as well as in nunneries. He stressed the importance of coming to grips with the Two Truths, conventional and ultimate truth, pointing out that once you appreciate the gap between appearance and reality, you come to understand fundamental ignorance and the possibility of uprooting it. His Holiness managed to complete the entire empowerment before lunch. His final appeal to the audience was to dedicate special effort to developing the awakening mind of bodhichitta and the wisdom understanding emptiness, both of which are crucial to effective inner transformation. His Holiness ate lunch at Sera-Jey Monastery before returning to Sera Lachi. Tomorrow, he will be going to Sera-Mey Monastery to inaugurate the new debate yard there and explain Je Tsongkhapa’s ‘In Praise of Dependent Origination’.